Trouble challenges emotional relationships on a bright Sunday at Tamsui. A crafty and mysterious gentleman Ken Matsudaira comes to an office where two pretty girls Mayumi and Akiko have their problems on male-and-female relationships and decides to instruct them against their questions to free them. The Blue Sky is the first Asian digit-3D student film featuring individual tragedy between the Chinese pilot Zhengliang, Xu and the young Japanese pilot Ryuta, Watanabe in The Second Sino-Japanese War, 'brutality of war' as its theme. An office worker obsessed with the supernatural visits an old parking lot and finds evidence of ghosts of perverts. The renowned conspiracy theorists Benjamin Fulford and Kaoru Nakamaru give audiences a special lecture about various conspiracy theories. The renowned conspiracy theorists Benjamin Fulford, Richard Koshimizu give audiences a special lecture about various conspiracy theories. Furusato-Time is a sightseeing TV program of the major cable television company J:COM. And it's co-produced by Kyodo-TV. DSLR super 35mm filmic insert to wedding ceremony of local couple. The process of how a finance gets to the seaside where his bride is located in order to express and relive their dramatic encountering in a cinematic way. 12 thinkers gathered together to discuss the political issues in Japan, such as reuse of nuclear plants, accepting right of collective self defense, TPP and the secrecy law. Chinese film school students and the professors from the Greater China Region gathered together at Hong Kong Baptist University to discuss the many serious film issues in the region. A documentary featuring Ernesto 'Che' Guevara's revolutionary legacy and the success of the Cuban Social Welfare system. The Mr. Vampire is Back! The Best Hong Kong Genre Film of the 21st.Century! 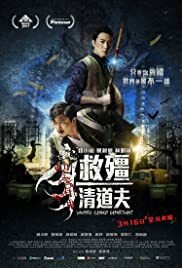 This feature film successfully restored and developed the tradition of Goeng Si, the Chinese Vampire franchise of the 1980s (1985-1989) ! I was really impressed with their eagerness and the perfect construction of the well made genre film! First of all, I have to thank you all film crew for making this remarkable Hong Kong genre film that other countries are not able to make. As you know, what Mr.Vampire series (1985-89) depicted was stewardship between a stubborn master and his bad students. The three act structure well embodies the bad students' development via comedic interactions with their stubborn master. For instance, in this film, Chin Siu-ho's role is equal with Lam Ching-ying's Taoist master in Mr.Vampire (1985) in which he played his student. And Babyjohn Choi is equal with the Chin's role in the master piece. The most impressed detail is that the directors selected the cleanup department workers as their Ghost Busters of Hong Kong who are decisively effective and full of contributions to the hygiene of urban and rural sights all over Hong Kong. This setting complies with the foundation of art in general according to what Leo Tolstoi said in the late 1890s. About the creativity with the newly renovated Coeng Si, their computer graphical work resembles the vampires in the rebooted Fright Night (2011) and Let Me In (2010). In conclusion, this film was loved and welcomed by kinds of the contemporary Hong Kong film audiences and me! One of the casts, Richard Ng said that the traditionally loved Coeng Si film is comedy! Yes, he was right! Thank you again for this great gift for Coeng Si film lovers! 139 of 147 people found this review helpful. Was this review helpful to you?